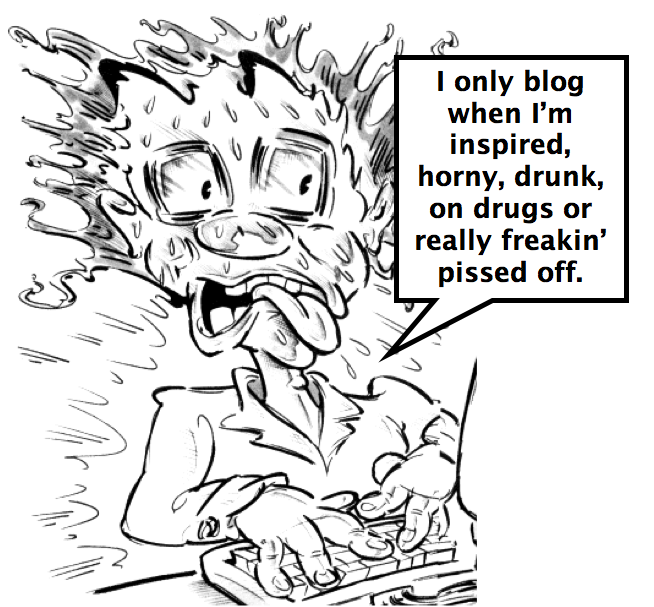 RogerBlazic.com: What The Hell Did You Just Write On Your Blog? 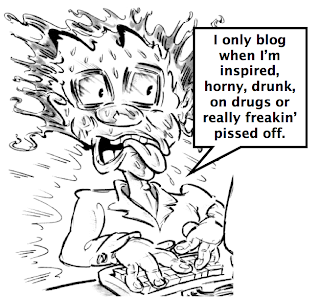 How NOT to blog, if you want an audience. There is a good friend of mine on Twitter and other social networks and she told me that she only writes on her blog when she's inspired. Then, she hammers out a post in one shot - no proofing, correction, alterations, spell-checking, editing, etc. Presses PUBLISH, and he's done. I've read her posts and every now and then I have to ask, "What the hell did you just write on your blog?" Let's call my friend Egg. She is bipolar like me. So, we both have a tendency to get a little manic and start typing and typing - but we have broadly different outcomes. When I go into manic mode, I produce nine blog posts in one night, publish them all and find out the next day that half my email subscribers quit because I flooded their inbox. I have since changed to publishing only twice a day - AM and PM and throwing in time sensitive pieces when needed - like a TV show review or news flash. People like routines. I'm trying to get into a routine, so you will know what to expect from RogerBlazic.com. Egg on the other hand gets a little scrambled. She writes about her experiences with her bipolar condition, which is fine. Lots of people write from a personal perspective. One of the funniest I know is Maniacal Mom. Her blog, Maniacal Mom's Moments is hilarious. It's all about her as a single parent, with a few other goodies thrown in. It's worth reading. It's worth bookmarking. It's worth sharing. Egg's blog posts are more on the line of rants done on a street corner. By that I mean, what comes out of your mouth, you can't take back, correct or edit. It is what it is. Egg takes the same approach to her writing - whatever channels from her through a keyboard and onto her screen goes out - no corrections, edits, revisions, etc. That may sound like a neat idea, if you're a free-form poet and you're in a coffee shop full of potheads and people wearing sunglasses in the dark. But on the Internet, you're out there for the masses. And there are several billion places they can spend their time. Will they want to come back to your site? That is the only question you have to ask. In general, Egg's content is fine. It's the "ramble on motherf**cker" style that needs some tweaking. In my How To Start A Blog series, under the course on Best Practices, I wrote about a couple no-no's with blogs. Misspelled words and grammatical mistakes make you look, how can I say this gently, unenlightened - or really freakin' stupid. When I used to teach branding to corporate clients of my advertising agency in Las Vegas, I would tell them, "If you have a small group of customers, they don't care if you have a hole in your shirt or mustard on your pants. They know you personally and only care that whatever you do works for them. But when you start reaching out to a bigger audience, you have to dress and act in a more professional manner." And that holds even more true on the Internet. Here on the net all you have is a 2-D world. Unless you make YouTube videos, no one knows what you sound like or how you act. And if you don't have a picture on your blog, then your mental picture is completely up to the person staring at your site. "I bet she looks crazy or has a damn tattoo on her forehead." or "That sumbitch must not have no teeth. I bet he chews." You don't want that. Egg, I'm not beating you. I want you to be the best egg on the net. I prefer mine sunny side up, not scrambled. The choice is yours - rant or write. Ranting only requires emotion. Writing takes some effort. Unless your rants are really hilarious, most people prefer writing, good writing, insightful writing, funny writing, emotional writing, honest writing, provocative writing, educational writing - but they won't read any of it if it's sloppy. Follow the rules of writing, then, write whatever you want. And you'll have fewer people asking, "What the hell did you just write on your blog?" Can I have toast with my egg?